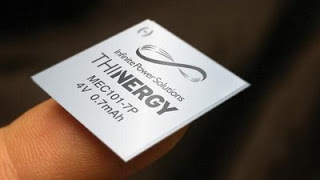 The new line of THINERGY Micro-Energy Cells from Infinite Power Solutions Inc (IPS) could soon be powering small devices such as autonomous wireless sensors, powered smart cards, active RFID applications, and implantable medical devices. The manufacturer says these tiny, rechargeable, thin-film batteries combine the energy density of traditional batteries with the high discharge current of supercapacitors. With some models measuring just 0.5in. square (12.7mm) and less than .01in. thick (0.17mm), IPS claims these are the most powerful batteries for their size. Designed to outperform Lithium coin cells, printed batteries, and other thin-film batteries, the THINERGY Micro-Energy Cell (MEC) family includes four models of varying size and capacity. Each MEC is a thin, flexible unit that can be easily incorporated into compact hardware designs. Multiple MECs can be stacked to increase capacity and output without increasing the unit’s footprint. The THINERGY MECs are even thin enough to be embedded and laminated into printed circuit boards or other materials. The THINERGY MECs are made from sold-state chemistry, with no liquid or organic polymer electrolytes used. IPS says this construction allows the MECs to support more recharge cycles than other rechargeable batteries, and to hold their charge longer with less loss. A fully-charged MEC will lose less than 1% of its charge over a year. The Micro-Energy Cells have no “memory” effect like other battery technologies, so they retain their full capacity throughout their life. Each MEC requires only 4.1V for charging, and can accept a charge with as little as a few hundred nanoAmps of current. Depending on the charging current, a MEC can recharge in as little as a few seconds or as long as 10 minutes. IPS believes the charging characteristics of its THINERGY MECs make them ideal for applications involving energy harvesting from sources such as solar, RF (converting radio frequency into current), kinetic, or thermoelectric. In addition they can be charged using more conventional methods such as direct wire connection and inductive charging (using a magnetic field to induce current). The energy harvesting solutions provide a continuous, autonomous power source that, depending on the design, may provide a sufficient trickle charge to the battery such that a conventional direct wire recharge may never be needed, allowing decades of power without battery replacement. The MEC120 and MEC 101 are available now. The MEC125 and MEC102 will be available in the fourth quarter of 2009. For more information and complete specifications visit Infinite Power Solutions.